Health Kismet is now completely integrated with the two most avant-garde payment technologies in the startup space today: Bitcoin and Dwolla. As you can see in the picture below, when you checkout on the website you’ll have an option to choose either as your payment option, and have a fully integrated checkout experience, just as if you were using PayPal or credit card! 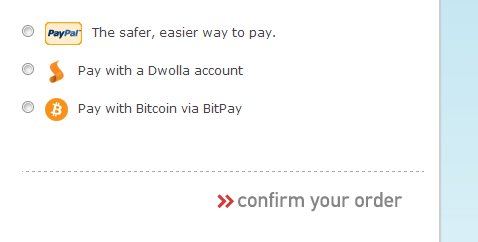 What are Dwolla and Bitcoin? Dwolla and Bitcoin are nascent payment companies that offer consumers different ways to pay for goods and services. However, there are important differences between the two. Dwolla is designed to be an alternative to traditional credit cards. When you pay with Dwolla you are transferring cash from one bank account to another, and skipping traditional credit card networks entirely. Bitcoin is a digital currency. But instead of being minted from the Treasury department it’s minted by a decentralized network of computers that are tied together through an algorithm to continuously make more bitcoins. Bitcoin isn’t a payment network, it’s a type of money that only has a digital footprint. You can find out more about Dwolla here and bitcoin here. With both payment methods you’re redirected to the host’s website to complete your transaction, and then taken back to the Health Kismet website. If you don’t use either of these payment methods or have no idea what I’m talking about you don’t have to worry. You can continue to use paypal and credit card as you always did. Next Post Should You Eat Greens to “Alkalize” Your Body? No.